Well our expectations have been really high for this Michelin starred restaurant, not just our dinner at the half board restaurant of the Sonnenalp has been outrageous. The restaurant is situated is the main building of the hotel Sonnenalp. One of the small elevators leads directly into the restaurant Silberdistel* on the fourth flour. Upon a warm welcome by the headwaiter we have been seated at one of the first row tables with a nice view over the Alps. Before the whole experience started we got the aperitifs together with a small amuse bouche containing a mountain cheese quiche with guinea fowl roulade. A few minutes later our waiter brought us the menu and finally a bottle of sparkling water. As a guest of the restaurant you have different choices regarding the menu. Prices for a menu are around 110-155 euros. It’s up to your preference to select from two 6 course menus or some classic dishes like lobster (55 euros), Beluga caviar (155 euros) or the Chateaubriand (39 euros). The classics like lobster are prepared directly on your table by headwaiter McLaren. Unfortunately my colleague and I didn’t know that these classical dishes are unique at this restaurant and we didn’t order any of these meals what we later did regret a bit. Anyway we ordered a five-course menu called “Culinarium” with an excellent wine pairing provided by our charming waiter. The restaurant itself was very busy and we had to wait some minutes for the courses. After the second amuse bouche, which was a really tasty smoked duck breast with celery salad, we got a selection of bread with two different spreads. 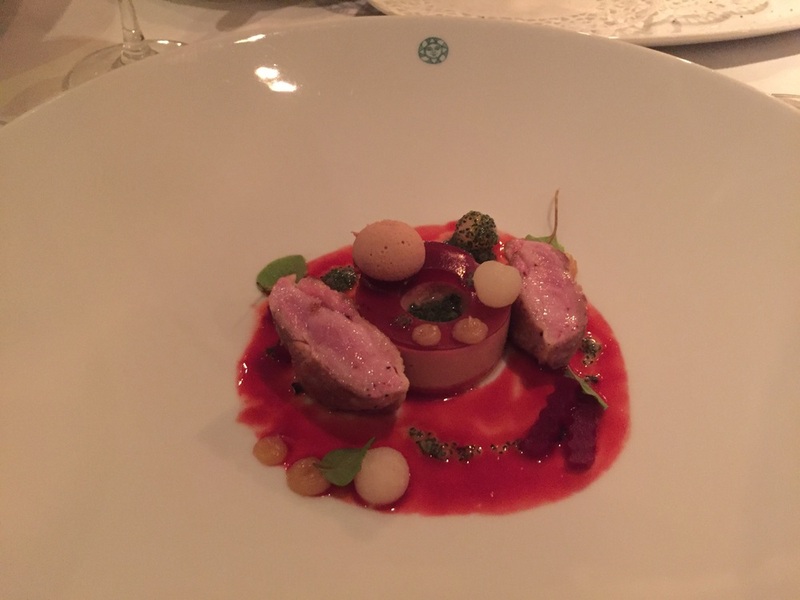 The actual dinner started with a quail breast variation enclosing a terrine and a perfectly roasted breast. The change of cutlery after every course offered some breaks between the courses - so enough time to enjoy the dinner. Our second course was a roasted grey mullet with truffle jus and green jumbo beans. I would describe the fish to be a little bit overcooked but still very delicious. Following this course, we decided to take the traditional Swabian oxtail raviolis filled with mountain cheese served with ginger spinach, jumbo shrimp and nut butter foam, which was literally an explosion of taste. As a small appetizer before our main course, which was a composition out of veal meat containing tenderloin and belly served with carrot cream, we got a sorbet made out of grapes. The dessert was an Ashanti chocolate cake, served on the plate like a painting. In addition to this delicious dessert, we were served filled chocolates and petit fours with an Espresso. Unfortunately none of these chocolates did really meet our tastes. All in all it was a very good dinner within a very busy Michelin starred restaurant. We were guests of this michelin-starred restaurant. However all above written expresses our own opinion and has not been influenced.